The latest World Bank’s Doing Business Report indicates India has jumped 30 places to stand at 100 in the new rankings. 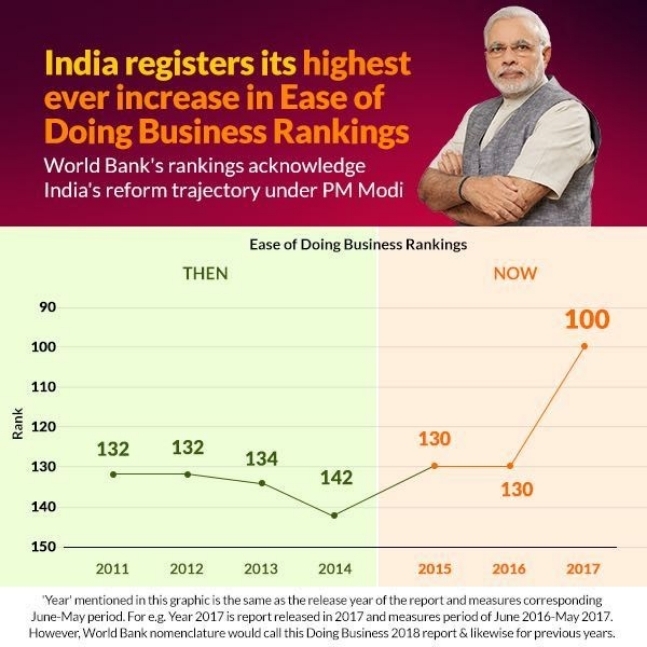 This is historic for it is the highest jump by any country in the doing business sector and acknowledges India’s reform trajectory under the leadership of Prime Minister Modi. 2. The business environment has improved at the fifth fastest pace in the world and India is among the top 10 ‘improvers’ globally, having done better in 8 out of 10 business parameters. The country has jumped 53 places from 172 to 119 on ease of paying taxes, leapt over to the 4th rank on protecting minority investors and moves 15 places from 44 to 29 on ease of businesses getting credit. The most significant jump is in taxation policy parameter.